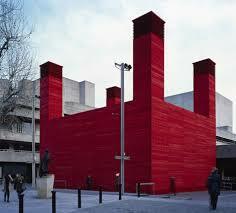 You can’t fail to notice the The Shed, the National Theatre’s striking addition to London’s Southbank. It looks a little like a student’s upturned IKEA table. In bright red. Walking into this new temporary venue, which on the inside is somewhat reminiscent of The Young Vic, is quite an adventure in itself; the smell of new wood, a wonderfully up close and personal stage area, visible stage management and technical. I like it already. The idea behind The Shed is for The National Theatre to celebrate original, ambitious and unexpected new theatre in an excitingly small venue. And on this level, boy does Mission Drift deliver. 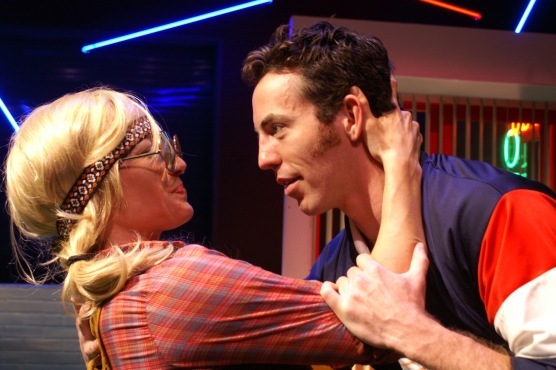 Created by New York based The TEAM, Mission Drift is a stunning, well-crafted and inventive musical, yes it’s a musical, which takes us on a whirlwind journey through the American dream. From Las Vegas to New Amsterdam, covering 400 years of political and economic history (atomic bombs, economic downturns, slavery, prospecting, gambling; it’s all here), we follow two couples on their pioneering adventures. In the world we recognise is Joan; a cocktail waitress laid off from her job and alienated from Las Vegas – the city she once lived for. Joan’s life is changed by the arrival of a mysterious and beguiling stranger who offers her a way out of everything she knows. And loves. This is equated to the mythical journey undertaken by two 14 year olds, Catalina and Joris, setting sail from Europe with the Dutch West India Company to start a new dream, in a land where space, as well as life, is cheap. All of this is overseen by Miss Atomic (Heather Christian), an all at once alluring and repulsive figure who epitomises the best and worst of American capitalism. Her narration is funny, sleazy and engaging – a clever way of holding this bubbling pot of ideas together. She has a voice that grabs you by the balls and dominates the space. I wish her character could have been more intertwined with the two couples but it was a stunning and strong performance that captured the fragility of the American Dream perfectly. The cast of five, musicians and crew worked seamlessly together with impressive physical skill. The use of chairs, sand and sunglasses to represent just about everything stayed clear of cliché through some very inventive directing and stage management. Mission Drift feels like Natural Born Killers crossed with On The Road, Fear and Loathing in Las Vegas, Elvis Presley and a Billy Connolly documentary about Route 66. It’s unflinching, fast paced and uncompromising, yet it still manages to have a heart. And miraculously, it is a musical with songs; wonderfully bluesy and punchy numbers that you actually want to listen to again and again. It carries you away and leaves you quite breathless. If you get left behind, then dammit that’s just the ‘way of the world kid, get used to it.’ It definitely appealed to my sense of wanderlust and I left feeling energised and inspired – it even made me stay behind and get a late night drink at the bar on a Monday night. I urge you to see it while you can. This production was reviewed by Sarah Elaine Stewart.